Cache County, UT — Special precast box culverts were used for one of the most significant segments of the $25.8 million emergency water restoration project, designated by the NRCS, known as the Cache Water Restoration Project (CWRP). The CWRP project involved the reconstruction and improvement of approximately six miles of mostly open, unlined channels that make up the Logan and Northern, as well as the Hyde Park and Smithfield canals. The project incorporated new precast pipeline, box culverts, a section of pressurized pipe, metering systems, turn-outs, head gates, and improved maintenance access. The Cache Water Restoration Project is the result of a fatal landslide in 2009 that killed three people living in a home below an irrigation canal that hugged a steep hillside in Logan, Utah. The tragedy prompted a total reconfiguration of the canal systems. It has been a three-year process to reconfigure the canals, meaning shareholders and farmers along the waterways have gone without water since the breach. These canals are the heart of the community’s economy and culinary water security, their lifeblood. The new improvements to the canals will deliver water more safely and efficiently to the many shareholders that include a range of individual, agricultural and institutional users. With irrigation water restored to the canals by May of 2013, , the Cache Water Restoration Project included many features, but the canyon section of the project needed repair to alleviate the leakage in the steep canyon. 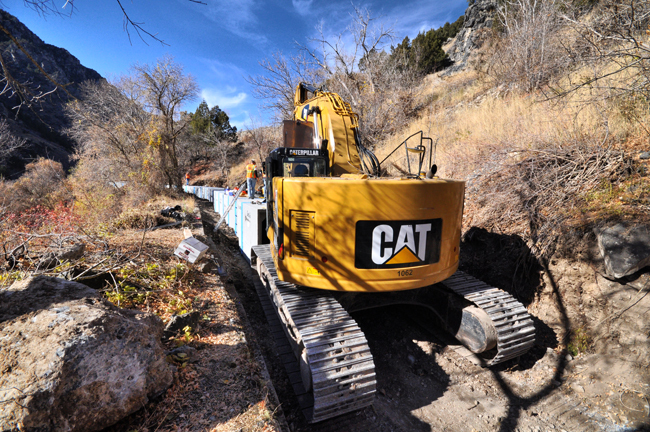 One of the key components of the project was designing the piping for the open channel section of Logan Canyon. There was uncertainty about fitting a precast, reinforced concrete box culvert into the existing canal section. This section of the canal, constructed over 100 years ago, was basically carved into the cliffs along canyon. At its widest, the open canal was approximately 14 feet wide with steep cliffs rising above the canal and sharp drop-offs to the state highway below. After considerable investigation, the project designers decided on precast box culvert to solve part of the problem. Oldcastle Precast was contracted to supply approximately 10,000 linear feet of specially designed, precast concrete box culvert and precast pipe that was used in the upper portions of the canal project. 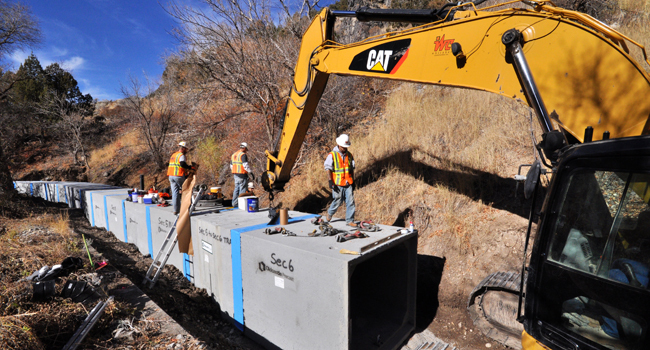 Of this nearly 4,300 feet of precast box culvert was used (some 5’ x 5’ and some 6’ x 5’ to match the hydraulics of the canal) for the Logan Canyon section. Designing a box culvert that would fit within the channel without impacting the steep slopes on either side was the challenge. To accomplish this, designers had to bevel the majority of the box culvert segments so that the box culvert could “snake” along the alignment, without elbows, transition vaults or closure pours. There were some sections of the canyon where precast was unfeasible due to the impracticality of being able to fit heavy construction equipment into the canal (the canal narrowed to eight feet wide with overhanging cliffs in some sections). While the cast-in-place construction was extremely well performed, the speed and efficiency of precast box culvert allowed for six times faster construction. Some of the cast-in-place construction slowed to a halt during January of 2013 as the temperatures were too cold to pour concrete for several weeks. To manufacture bevels, Oldcastle Precast designed and purchased new “headers” that could bevel (or angle one side of the box culvert so that a series of bevels would form a curve) up to an eight inch drop in length when measuring opposing sides of the box culvert. The joint at the end of each bevel was the same as straight box culvert sections, so that there were no extra requirements at the joints. To fit the numerous curves in the canal alignment, beveled precast box culverts were designed in ½ inch increments with bevels ranging from ½ inch to 8 inches. The bevels had to be specifically designed as “curve to the left” or “curve to the right” and each piece of box culvert had to be numbered and installed in a series so that the box culvert did not deviate from the alignment. After emerging from Logan Canyon, the water is transferred from the box culvert to a 66 inch concrete pipeline that heads north. Whitaker Construction installed each section so that the inner joint gap measured 1/2”. Once the alignment was established, the installation progressed rapidly with the contractor averaging over 15 sections per day. This was a record rate of installation when considering winter conditions and that only one access to the upper section of the project existed, so the box culvert and its bedding materials had to be transported 3,000 feet along the canal at the start of the section. The box culvert was backfilled with 6 inches of road base to provide for a maintenance access road and a recreational trail. The top of the box culvert is now gated at both ends and can be used for maintenance as well as access by the U. S. Forest Service. “The canal operators used to have to drive a truck in the channel to do maintenance like removing rocks. The box culvert eliminates that problem. We’ve built an access road on top of the box culvert with openings for access,” said Zan Murray, from the Logan office of project manager J-U-B Engineering, in the June Issue article of Utah Construction & Design. The project was designed and constructed according to a contracting method called Construction Management General Contractor (CMGC) which utilizes an integrated "Team" approach. The CMGC method includes both pre-construction and construction phase services. The CWRP CMGC Team included the owner (Cache County, NRCS), program manager (J-U-B Engineers, Inc.), design engineers (Montgomery Watson & Harza and Hansen, Allen & Luce), and contractor (Whitaker Construction Co.), who worked in tandem to deliver a quality project. The revamped Cache Valley canal system came in under budget and ahead of schedule. This Project has received an outstanding project award by Utah Construction & Design.